©Healy Racing Photos When you are a small trainer like me, you are up against it but all you are ever trying to do is get the best from the horses you have. You are picking up horses on a budget, you cannot deal in the numbers that the big lads do, where they can go through so many to get to the one good one. So it was great to have a winner at a big meeting like the Dublin Racing Festival in Leopardstown last Sunday. 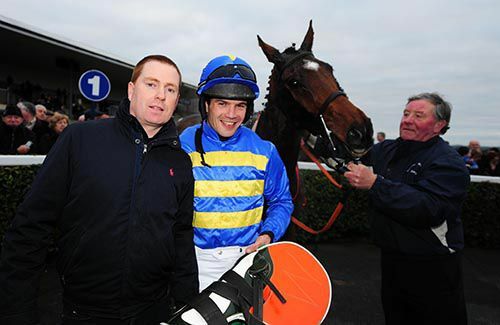 The year has been going nicely and Santa Rossa was our ninth winner in Ireland, and that follows on from the 13 last season, which is our best tally so far. We have also had one in England, when Canardier won in Cheltenham last October. I had five winners last year on the Flat as well, with Commander Won doing the honours three times at Dundalk before Christmas. We’re doing what we can with what we have and we have a few nice young horses. Nice for us though might be fourth or fifth in a maiden hurdle! That’s just how competitive it is and you’ve got to be realistic. She’s improved obviously since then and did her job well in Leopardstown. It was a good bumper, with plenty of talking horses. She was a bit green again but Finny Maguire got a few cracks into her and straightened her up. Mark O’Hare said the same the first day, when she hit the front, she was all over the place until she met the rail and had a guide. But she hasn’t been in a schooling race or anything, they’ve all been cancelled up here with the ground. Maybe it’s all for luck. You’d like to think she’ll improve again. No immediate plans have been made. She won’t do a lot for two weeks anyway as she’s a very easy filly to train. She doesn’t need a lot of work. Cheltenham might be a possibility but she got more money for winning on Sunday than she would for winning there, though obviously the thought of winning at Cheltenham is always a draw. There’s a race in Punchestown for her, there’s another one in Liverpool which might suit. She might also go home. She is definitely one for the future, the sort of horse everybody aspires to have and the owner will look to do the right thing by her. She’s only a young mare with two runs but she’s after getting her black type already. She is very slick over a hurdle too so there is plenty to look forward to. The reason you get up every morning is to try and get these horses and to have a winner at the big meetings. Everyone gets a kick out of it in the yard. It’s a hard job keeping these horses healthy and right and a great lift for everyone to be able to take on the big lads. You wouldn’t be anywhere without the staff. Canardier seems to be a nice horse too though I wouldn’t say he’s a Grade One horse over hurdles. He was meant to run in Wetherby on Saturday but that’s been scratched with the equine flu concerns in England. I probably won’t get a run into him now before Cheltenham. He’s rated 141 in England so if I run him in a handicap here and he wins or runs well, he’s going to get a few more pounds. He has an entry in the Ballymore but you want an exceptional horse for that as Nicky Henderson, Willie Mullins, Gordon Elliott and Joseph O’Brien all have horses for it. I think myself the Martin Pipe might be the one, though he would probably be off top weight. He’ll be a nicer horse over fences. Whatever he does now is a bonus. He won’t have run since October but it was good to see him do it over course and distance that day. We bought him off Barry Geraghty, who rode him in Cheltenham. He said he’s a fine horse, with a fair engine, a good cruising speed and he jumped well. We have a full house at the moment, 34 horses. The profile is a Dundalk horse, a point-to-point horse and a track horse. We’ll work with what we can. It’s all competitive now. I don’t have owners to buy stores. I’d rather pay 30 or 40 grand for a horse that’s been placed maybe in a five-year-old point-to-point maiden and we’ve had a bit of luck with them. I was never going to do anything but be involved in racing. My father Liam worked with Tom Dreaper for years and rode Kerforo to win the Irish Grand National in 1962. They also won the Thyestes, the Dan Moore and the Leopardstown Chases that year. Three years later, he won what is now the RSA at Cheltenham on Arkloin but maybe his greatest claim to fame was riding Arkle to his first win in a three-mile maiden hurdle at Navan in January of 1962. That really was a good year for him! Kerforo was actually favourite for the race, ridden by Pat Taaffe, and Arkle was 20/1 but he flew home. My father told Pat that they were just cantering. He rode Arkle and Flyingbolt a lot at home and always thought Flyingbolt was the better horse. It would be the first question people would ask him. Arkle was some horse though. They had to change the whole handicapping system because of him. My uncle Peter also rode winners for Tom Dreaper, and his son, ‘Young Peter’ rode winners for Noel Meade. I joined Dreapers as soon as I could and rode around 20 winners for Jim but I picked up a few injuries and gave up in 2007. I got to ride the likes of Carvill’s Hill, Merry Gale, Harcon and Notre Pere during my time with Jim and I would still ring him from time to time for advice. Vics Canvas was one of my earliest winners in point-to-points and he was a brilliant horse for us. He was lucky and unlucky. He won a Cork National, was third in a Paddy Power, second in a Whitbread, third in the Aintree National when he went down on his nose. He never failed to deliver when he stood up. He was a small horse but he’d a huge heart. He’d give you everything he had. He was tough out. Santa Rossa is at the other end of her career, just getting under way. She has already given us a big day out. Hopefully there are more to come.